Welcome to my part 2 of the trip report! This time, I decided to sit near the rear of the aircraft. I am not a fan of sitting at the rear as it tends to shake quite a bit especially in bad weather. 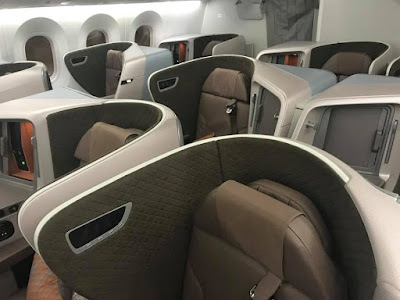 However, I wanted to have a feel of being near the back of the 787-10. A better chance of having the seats beside you vacant and fortunately for me, I got what I wish. 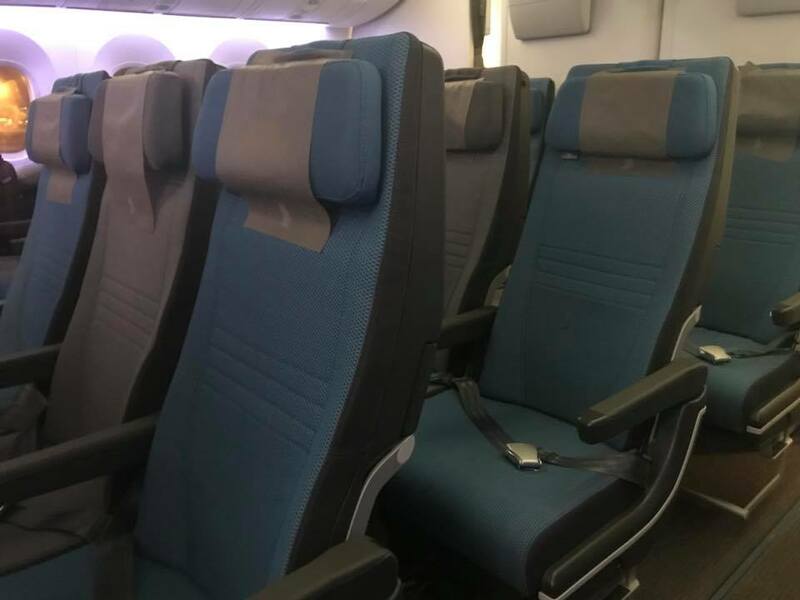 So whole row to myself. This airline used to offer free seats for regardless you fly on, but now you have to pay for seat selection which I don't understand why. 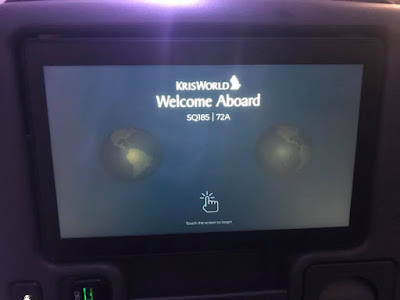 For my flights with SQ, I would wait for the web check-in to choose my seats - perhaps I will pay for long haul flights. Avoid the red marks as the seats are pretty bad. Row 73 is windowless, do take note. Spent a few days in Saigon and soon was time to head home. I have taken enough photos of the city and food, you can find them in my previous trip reports - check out SIN-SGN ones. So I will not cover on that for this report. 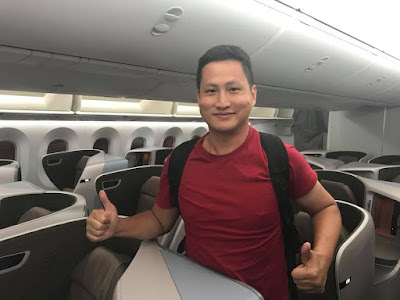 On the day of departure, I didn't have to rush as the flight was in the evening. Plenty of time to spare. Went around the city for good food and dessert before slowly making my way back to the hotel before departing for the airport. I did the online check-in and it was scheduled to be the Boeing 787-10 so hopefully that remains as it is. Thanks to Flightradar24, 9V-SCF was on route to Saigon while making my way to the airport. The fear of getting "SQ-ed" had vanished at that point. Once at the airport, there were queues waiting for the counters to open. Fortunately for me, the web check-in counter had the least number of travellers so I got my boarding pass quickly. 9V-SCF came on time and preparation of the aircraft for the return flight was fast, around 40 minutes to clean and get ready for it. Boarding announcement were made and the agent was at the counter to check that we boarded the aircraft accordingly to zones. 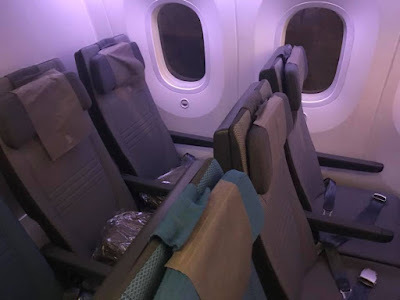 Once on board, I was pleased to know that I got the whole row for myself, the passenger sitting behind me was not pleased with the windowless seat but it was a night flight so it wasn't so bad. 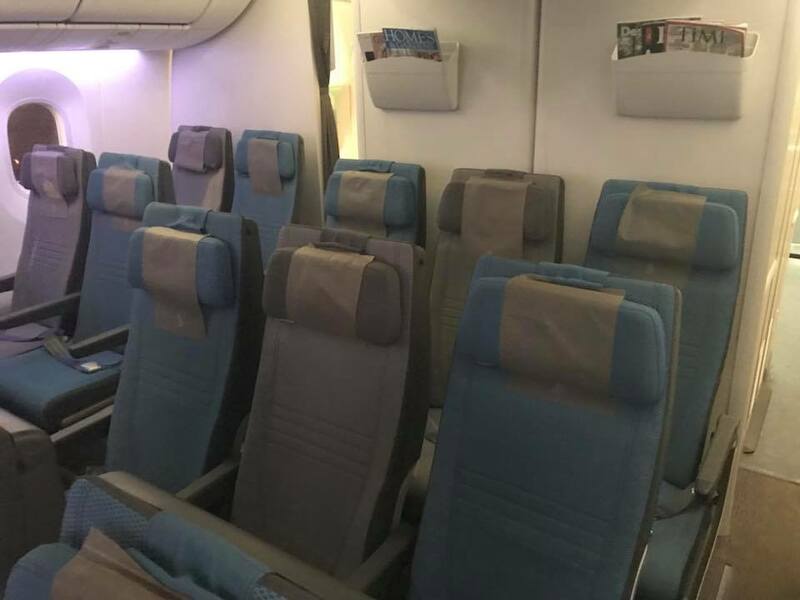 Some photos of the Economy Class seats at the rear. You can notice the length of it, longer than the -8 and -9. 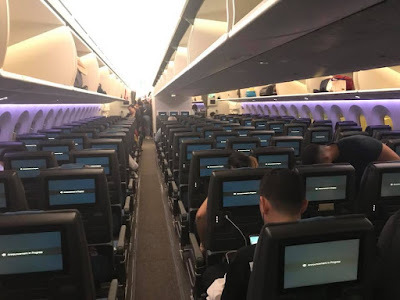 The crew on board were similar to my previous flight. Maybe with one or two happy faces. Most of them looked tired and their hand gesture - you can tell - looked like they can't wait to finish their duty. The configuration is in the staggered configuration which means every seat gets an aisle access. I tried the seat briefly, it seems a bit cramp comparing to the A350. These seats are manufactured by Stelia Aerospace and what's the good thing about it? It can be converted into a 76" fully flat bed. It comes with a 18" touchscreen monitor powered by Panasonic. What I like is the storage and how convenient for you to do your work with the access of usb port and 3 pin socket near to you. 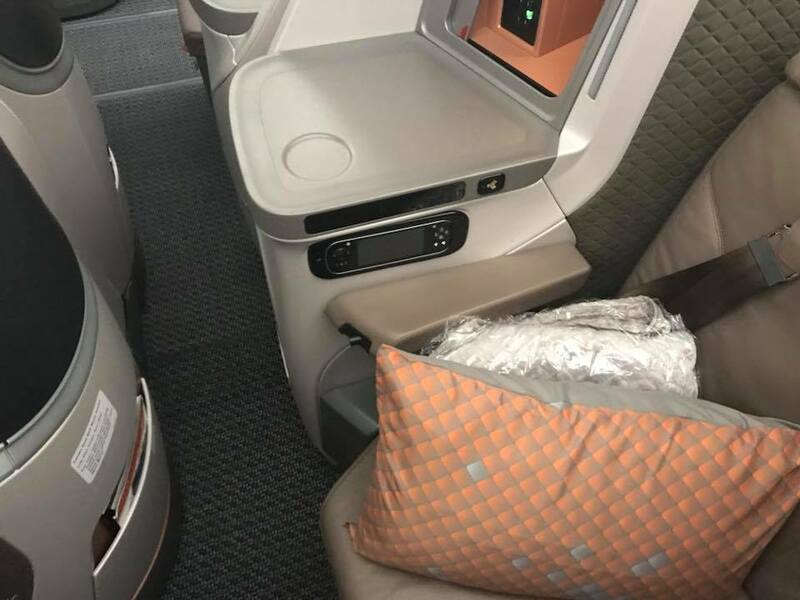 Small pillow and blanket are available for the J class passengers. For flights up to 6 hours, I think it is fine. 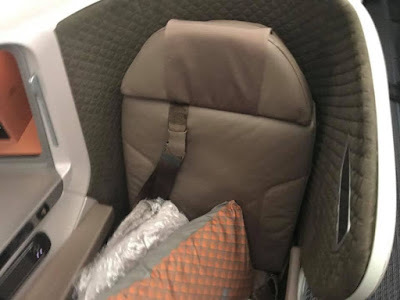 With the 26" inch wide for the seats, it may feel cramp for some, I have tried similar configuration before on another airline, I feel there's a lack of privacy especially when you are sleeping. Would I give this a try in the near future? Why not. Flight was a quick one with some bumps midway the flight. Seat belt signs were turned on and we enjoyed some good shakes for 15-20 minutes. After passing through the stormy area, the rest of the flight was smooth. Our meal was served quite late into the flight. Waiting quite a while for my food, I ended up being one of the last passengers to receive the meal and probably one of the first to get the tray collected, so I had to rush to finish my food. It would be nice if the crew told me to take my time and return later to collect the tray. I chose the beef option, it was not bad. 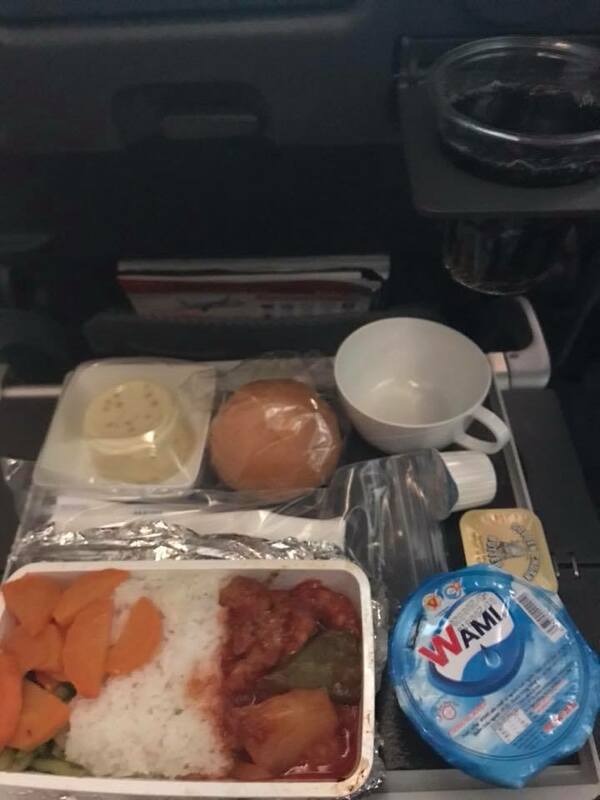 No ice cream for this flight. Nice to be on board this Boeing 787-10, seat 72A. Thanks to the business class crew, I managed to stay behind for a bit to check out the Business Class cabin. 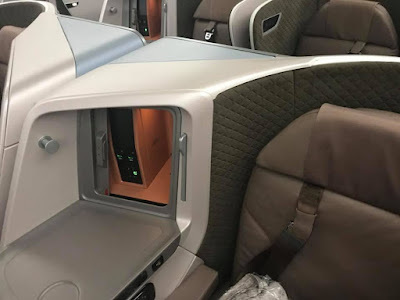 The flights I had on the 787-10 isn't enough to fully enjoy the offerings of the aircraft. 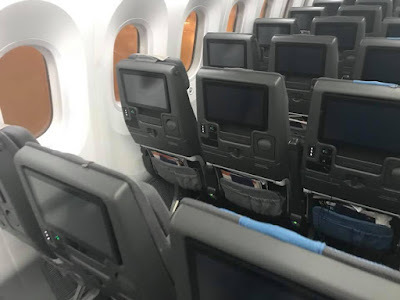 For the Economy Class, the airline has gotten a very good IFE product. 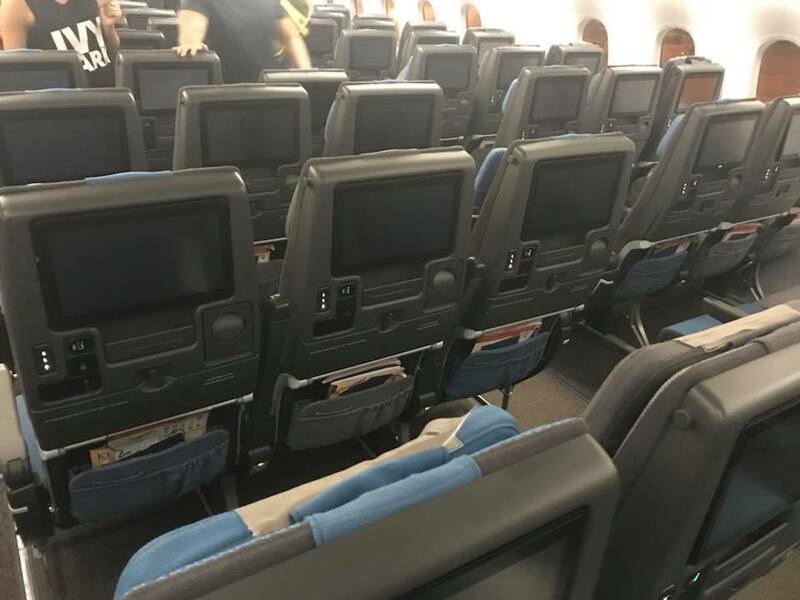 Seat may not be the best but its good enough for regional flights. 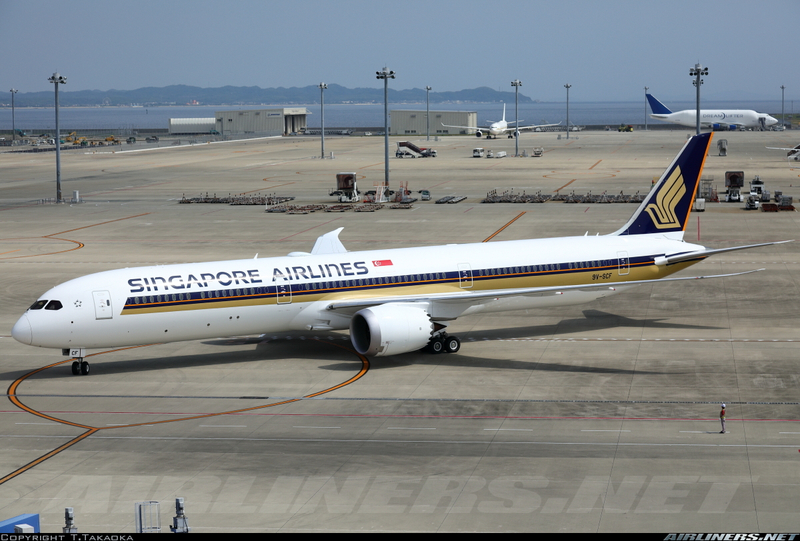 Overall, I enjoy my 787 experience with Singapore Airlines. 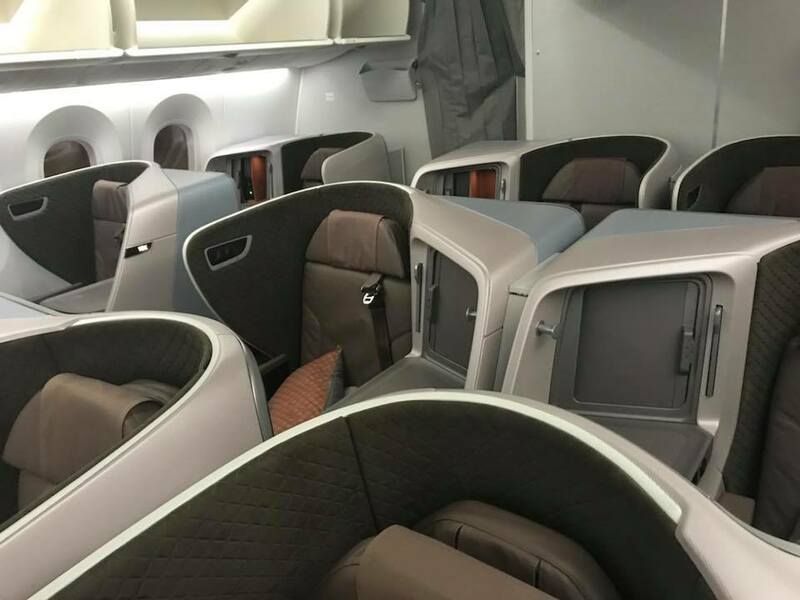 This airline has been voted the best airline in 2018. However there are rooms of improvement for them to do keep up. Website and the in-flight service (seems to have gone downhill for a while) in particular. Other than that, the innovation of their latest products are impressive. 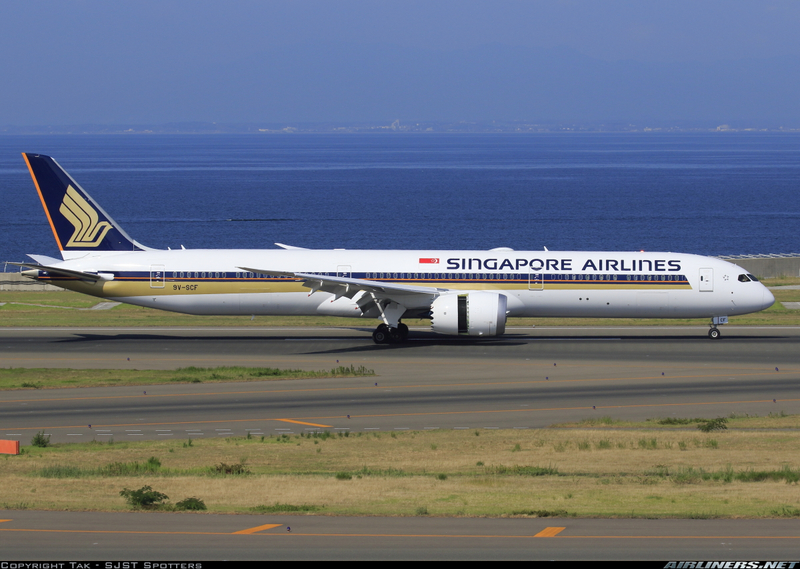 They are currently working on introducing even better products for their upcoming Boeing 777-9 aircraft. Looking forward to it! 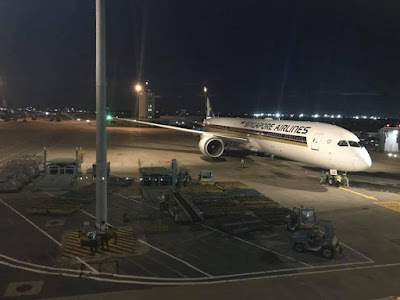 Meanwhile, if you are booked with Singapore Airlines, enjoy. 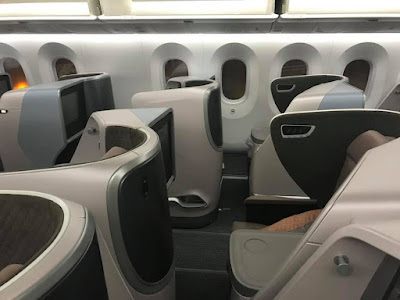 The current batch of Airbus A330-300 and Boeing 777-200/-300 may offer the old interior (product), they won't be around much longer once more A350-900 and Boeing 787-10 enter the fleet. 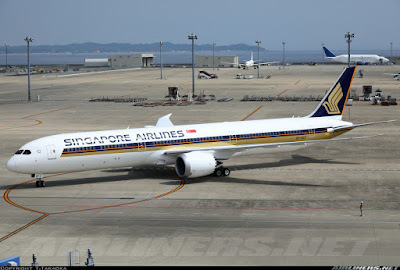 Additional info: The airline has ordered 49 Boeing 787-10 Dreamliners including the latest order and they will replace the Airbus A330-300 and Boeing 777-200 and -300 (Non ER), together with the Airbus A350 regional aircraft, this is the future of Singapore Airlines. Operating the most efficient aircraft in today's aviation. In addition, the airline has also ordered 20 Boeing 777-9 to replace the first batch of the Boeing 777-300ER fleet. As more aircraft are delivered, more routes would be introduced. I will keep this updated. For now, these routes are confirmed, with subject to changes. 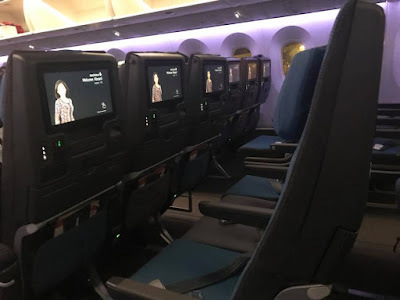 That's it for my part 1 and part 2 of my SQ's Boeing 787-10 Experience. Hope you enjoy it! If you have any questions, feel free to leave a comment below.